Comparing himself to a modern Jonah, who preached repentance and conversion to the wicked of Nineveh, Pope Francis denounced the injustice and violence that compels countless men, women and children to leave their homes in search of a better life. 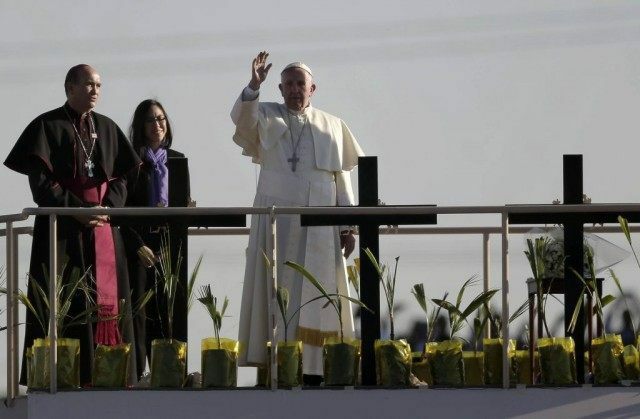 In his visit to Ciudad Juarez on the last day of his Mexico trip, the Pope intentionally sidestepped political issues such as immigration policy or border controls and focused instead on the unchecked corruption and violence that drives individuals away from their homeland. “The human tragedy that is forced migration is a global phenomenon today, Francis said, and cannot be measured just in numbers and statistics, but must be measured with names, stories and families. “No more death! No more exploitation! There is still time to change, there is still a way out and a chance, time to implore the mercy of God,” he said. In his words Wednesday, the Pope reiterated a message he had spoken earlier in the week, reminding Mexicans that the best way to combat the immigration crisis is by making Mexico itself the sort of place where people want to stay and build a home with no need to look elsewhere for opportunity and happiness. Despite the Pope’s concerted effort to depoliticize his message, others, such as the New York Times, could not resist the temptation to convert the pastoral visit into a stick to beat conservatives. “It’s not just Donald Trump, or Ted Cruz, or the rest who would expel immigrants by the millions and deny safety to refugees fleeing war in Syria,” they write. This was not the Pope’s message, but then again the Times had already outlined the story they wanted to tell, and weren’t about to change it just because an uncooperative pontiff didn’t read their script.